The J. Paul Getty Museum has announced that it will be returning a further Roman wall-painting fragment to Italy ("The J. Paul Getty Museum will return a 1st century Roman freso to Italy in May 2009", press release, April 7, 2009). The piece is described as "a landscape scene" and that it was acquired in 1996. 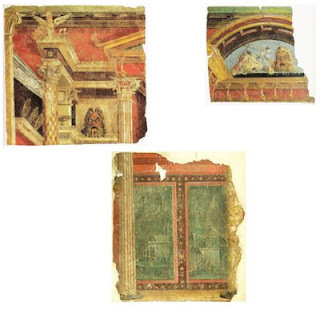 Our decision to return this fragment is based on a newly published image we saw about a year ago that included another fresco fragment that was being repatriated to Italy by a private collector. This image placed our landscape fresco alongside this newly repatriated fragment ... Seeing these fragments together made it clear that the two were part of the same wall design and belonged together. I presume that this fragment was one of the Fleischman fragments acquired in 1996 ("Gift of Barbara and Lawrence Fleischman"). It is likely that this latest fragment is the one that appeared as A Passion for Antiquities no. 125 ("Fresco Fragment: Vignettes of Cityscape") = inv. no. 96.AG.170 ("Wall Fragment with Landscape Scenes"). This will join two other fragments returned to Italy: one from the J. Paul Getty Museum, the other from the Shelby White collection (see my comments from January 2008 with initial reconstrcution). A fourth fragment was apparently seized from Giacomo Medici in Geneva. The latest fragment will be returned in May 2009. The arrangement of the fragments has been created by David Gill and is intended to give an impression of the original design. It is not an accurate reconstruction though the fragments are at the same approximate scale. This was originally created in January 2008. For further comment on the piece see the LA Times, April 7, 2009: Getty to return fresco fragment to Italy. not sure about the positioning here though clearly the pieces all come from the same work. The lower piece should theoretically have a column running through its centre if it was originally under the top left piece, because the unshown column at the right side of the pediment would run through it. Maybe instead this lower piece came from the far right side of the "structure" where the pediment and column would have been repeated.